We got to Hakata in the evening, very tired... Maybe the week of traveling, moving daily from place to place was too much, but I think another factor was the rain. Moving about in rain makes it much harder, as one uses so much more energy than usual. Feeling weak, we went to an Izakaya, ordered lots of salads since both our bodies were craving it, and headed to bed relatively early. Our impression of Hakata/Fukuoka was that it was another HUGE city, reminding us of Tokyo or Osaka- the skyscrapers, game centers, pachinko places and the countless restaurants and bars, could have been any of the big cities. It felt like it lacked personality and uniqueness, so we found somewhere a little further away to explore and found a truly unique place- the Nanzoin Temple. We encountered mini-buddhas were all over the temple area- each subtly but significantly different from another. It was fun just to see them, getting to know each "personality". Every person that comes here, must find buddhas that resemble the people in their own lives. 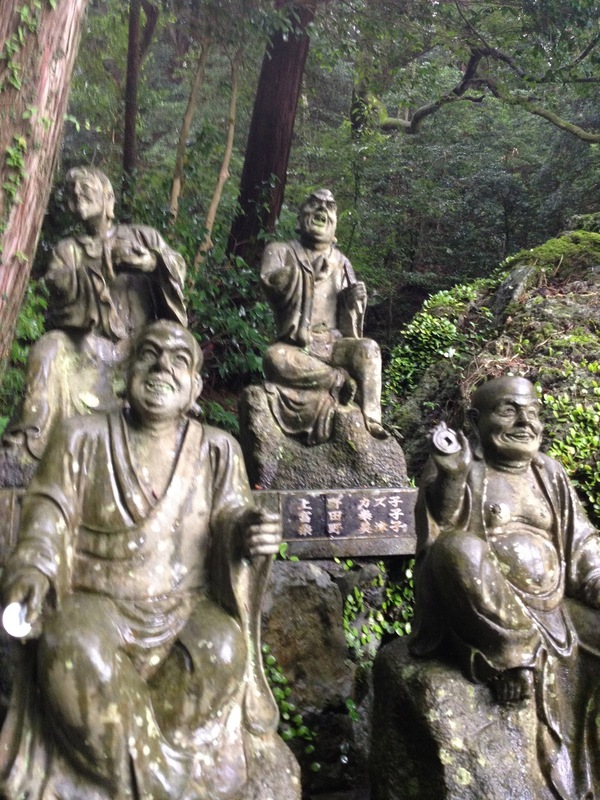 It was a beautiful space- buddhas, and ojizousans laid out all around the area, filled also with nature, including trees, rocks and waterfalls. They even had a cave looking rock that you had to climb through- a bit of an adventure inside that quiet environment. We were almost just the two of us, but it definitely felt like we weren't- it must have been all the gods and the spirits, following us. While writing this post and reading up on the place, I also learned that the sleeping buddha was made with a strong purpose- fearing that people are losing to be kind, only wishing for their own happiness, the monk built the buddha with the wish that people be reminded when they see it that we are able to live, by appreciating all the living things that surrounds us. 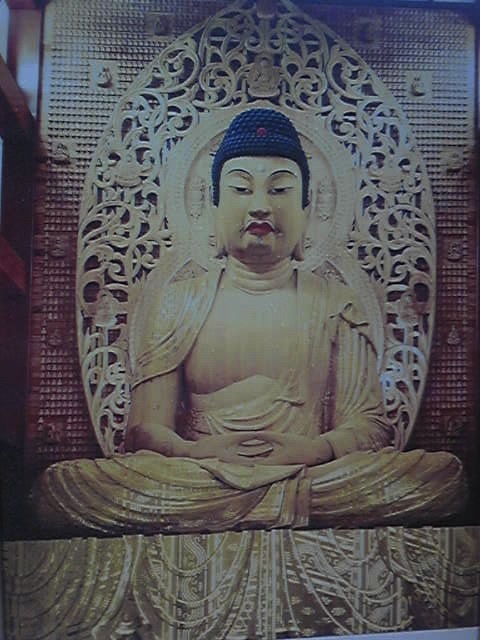 With the Buddha's peaceful facial expressions, I think the message is conveyed to people, each in its own way. 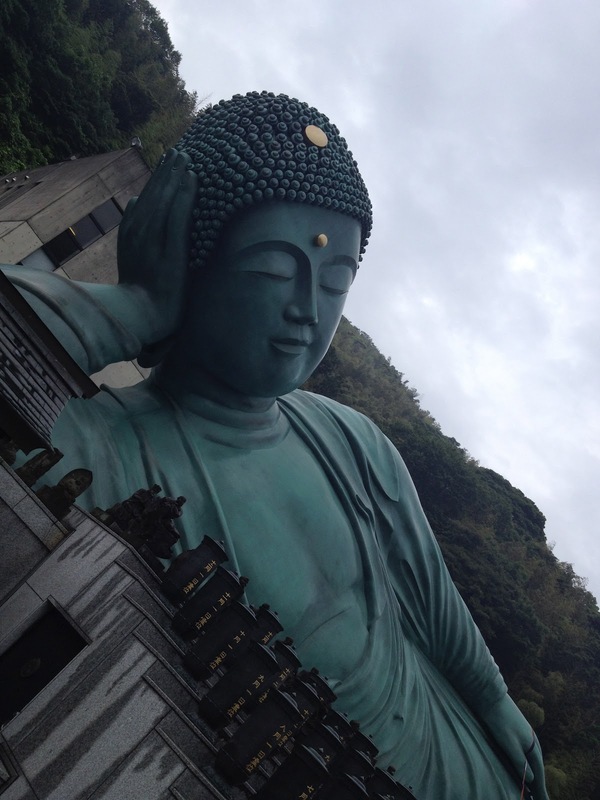 Before taking off we also made it to see the biggest WOODEN buddha in the entire world, situated in Hakata. Unfortunately no photos were allowed, so this one is from the internet. This one was also very very very big, with countless smaller buddhas stuck on the wall behind as well. Sara and I also went inside the Buddha- and walked the journey from hell to heaven. Afterwards I found out this is a way to worship- going through the "womb" of the buddha... kind of a strange concept, but it was certainly an interesting one. 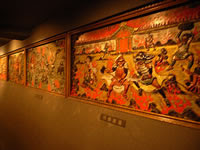 When we came inside underneath the buddha, there was narration and a series of painting explaining the different worlds of hell. After seeing quite horrific drawings and descriptions of hell, we entered a path of COMPLETE darkeess. We hung on tight to one another, screaming, while taking one step at a time, after a few minutes of walking in a twirly path... we reached "heaven". It is difficult to describe the feeling of reaching light and heaven- there was certainly a sense of relief, happiness and appreciation, and I was quite impressed and awed with this whole experience. After the very "buddhist" day, we satisfied our hungry stomachs with the famous Hakata Ramen- ramen with pork bone broth/soup. The set-up of the restaurant was interesting too, with booths for each customer, for the purpose of concentrating on the ramen. In your individual booth, there is a water pitcher, a manual how to best enjoy your bowl of ramen, and the staff serve you from a little window. Since the focus is solely on the ramen, you can only see the torso and hands, and hear your server... I never knew this kind of place existed and enjoyed the whole experience, including the yummy bowl of ramen! On the way out, we saw a family, and they had their walls folded away- and I was blown away by the japanese serving-spirit and flexibility to cater to all ages and demographics. If anyone is interested, this particular ramen restaurant has expanded all over the country with their unique style of serving. It is called "Ichiran".